Somewhere in the Eastern clan of snakes, a young female eastern milk snake, a few days old, was helping her mother snake to clean up the den. The young snake, known by the name of Sirius, named after one of the brightest stars in the sky. Sirius looked in a mirror near the kitchen. She was pale white with light red rings on her scales with black rings outside the red ones, “Mama, will I ever get venom like you and daddy?” Sirius asked, “Well, I am sure you will someday” her mother said sweetly, “Now c’mere and help me out Sirius, your brothers will be back soon from fishing lessons!” her mother announced, “Yes mama” Sirius said, and slithered over to the kitchen again. “I am afraid we are too late. Here comes your brothers” Sirius’s mother said quickly. 4 other snakes slithered into the den, along with her father, “Daddy, you’re home!” Sirius added with the noise of her 4 brothers, “Mama! We caught the biggest fish you could ever see!” one of her brothers hissed joyfuly, “Uh-huh! And we fought off a big ol’ alligator!” another one said, “No! 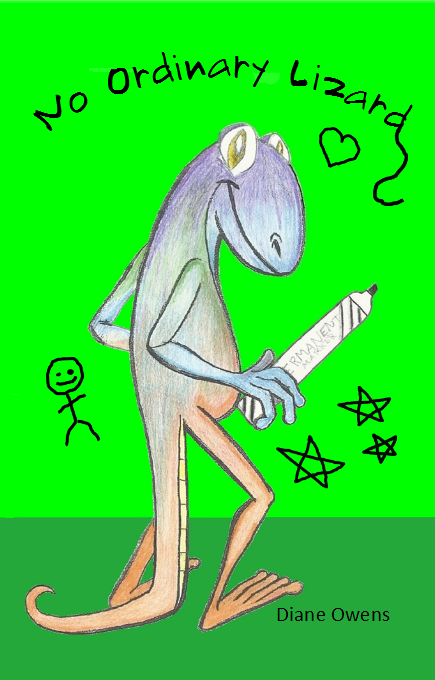 That was a gecko, frog-brain!” her fourth brother argued. “HUSH EVERYSNAKE!” her father shouted over the noise, “Me and your mother must talk now, go play or something, but stay in the den” he added. Sirius’ father slithered off with her mother into their sleeping chamber. Sirius’ first brother raised his head in the air, and looked around, then said, “What do you think Mama and Daddy are talking about?” Sirius did something brave and said, “I can try to listen to what they are sayin’!” suddenly, all her brothers shouted and cheered, “Your a brave lil’ sis!” her third brother said proudly. Sirius slithered near the door of the sleeping chamber and heard the outline of her parent’s voices, “I saw the Western snakes! They are coming this way!” her father said, “What! Oh Varix, what are we going to do! They will make slaves out of us!” her mother cried silently. “Hey, what’s that sound outside?” her fourth brother said, as Sirius withdrew from the door. A red milksnake peeked it’s head into the den and shouted, ” THE WESTERN CLAN IS HERE! RUN FOR IT LITTLE ‘UNS!”, “MAMA, DADDY HELP!” Sirius shouted, “Oh great fangs, children, quick, we must abandon home!” her father said as he slithered out from the sleeping chamber. Too late! Soon a large boa came into view outside the den, and screams bursted out in the village outside. The boa glanced over to see the den, “Hatchlings! Get to the emergency exit!” her mother hissed impatiently. It was also too late. A sleek indian cobra was blocking that exit, they were trapped! “Ahahaha, ooohhh, more slaves for the cheif” he said with a raspy voice. Sirius’s father lunged forward, fangs extended, ready to fight for his family’s life, “Daddy! !” Sirius yelled. Her father and the cobra wrestled, bit, and hit to the death, “Varix!! No!! !” Sirius’s mother cried out. Her father was pinned down and paralized “You’re all coming with me!” the cobra hissed commandingly. After a long journy to the Western clan territory, Sirius and her family had come to the heartland of the Western clan. It was a barren place with few plants, a desert with many hot rocks and cactus dotting the land. “LISTEN UP!” a deep voice boomed out of no where, “I am Cheif Boakinx, you will always obey my commands, for I am a boa, stronger and more powerful than all of you, and I am cheif. You will soon be assigned work roles” he commanded, Sirius could not bare to have left behind her father. She had soon realized this boa was the one who commanded the cobra! She would never work for this tyrant! “You tyrant! You frog-brain!” Sirius shouted from the ranks of her enslaved clan, “Silence little ‘un! Just watch your tounge or it may get cut off!” a Western soilder hissed to the snake he could not see. Cheif Boakinx cleared his throat and said “Now listen up, if your a female, go over here, yes, and all the males here. All will work in some manner. Adult females will help clean up indoors, make pots, whatever ya do at home. And all males and little snakes, even female little snakes, will work in the fields and some will train to become soilders. Now go and work!” Sirius boiled with rage and fear at the same time, “Stay strong lil’ snake, you have Valor for saying such things” a rat snake whispered to her while they slithered to the fields to work, “Thanks, well I am gonna get that frog-brain someday!” Sirius whispered back. Sirius was suddenly come over with a sense of responsibility, maturity and a sense of wits. She was well aware and ready to rip someone to piecies. She was on high alert, ready to find any chance to escape, back to her village.. She felt like an adult already. With a heart of steel and fangs like swords… As the day dragged out, Sirius had grown more alert. She examined every guard, and everyone of her tribe. She scoped out the rat snake that had complimented her bravery. She had to try and talk to him, she had to make friends. She had to bring some of her clan out of this land along with her, to gain freedom and gain strength to free everysnake from this barren land, and most of all, she had to find her father. That hot day had turned into a freezing night. All the Eastern clan prisoners had been led to their den, it was a packed underground compound for them to sleep, with a hole in the roof, for guards to check in on them. Sirius had been awake for a while, looking at the stars through the hole in the roof. She set her gaze over at the norther star, far away in the sky.. So far.. “If only I was really like the star Sirius.. Free to travel all over this world” she muttered to herself, just before she fell asleep..
At dawn, a guard poked his head into the hole in the roof and shouted. “Work time for prisoners!” which had scared Sirius awake after having an insane dream. As Sirius was slithering along to the fields where she was currently supposed to be working, she though of her dream. She drempt of a large lizard, made of stars, but the lizard was on the ground, staring right at her, until she was scared awake, “Are you a snail or a snake? Hurry up!” a guard shouted at her, but finally she reached her destination and started the endless work of pulling dead bushes from the ground and clearing rocks from the land. she stopped her work to whisper to a snake next to her, “Psst, do you know why we are clearing this plot of land?” but the snake ignored her. She repeated her question until the snake said, “ARRUGH! I DON’T KNOW!!! NOW STOP BUGGING ME!” Sirius poked her tongue out in a childish way, “Mmmmmm! !” she hummed while her tongue was out, and continued her work.. But when the sun went overhead, it made the work harder, since she had to slither across the scorching ground. She wanted to be home, slithering on the cool, soft ground, not working on moving boiling hot rocks, and shooing lizards away from the rocks, who would, here and there hiss at her and the workers, in their strange language. “Ugh… So hot..” Sirius grumbled after a while. But it got so hot, and she got so tired that she just suddenly dropped down, “Too hot…” she hissed softly, “Get up! I don’t care if lava rains down!” a guard scolded, but something stopped Sirius from her loud complaints. She saw a strange carving it looked like, in the ground, so she quickly, ignoring the heat, got up to dust off the carved rock jutting out of the ground, “Wise snake you are” the guard said to her. She ignored that too, and started to dust off the rock with the tip of her tail, and soon the layers of dust and sand spread out in the air revealed images on the rock of what looked like a story, told in stone, “Could that be? !” an Eastern clan garter snake said, “It’s an ancient tablet! Of the snakes and creatures before us! Ancient stories told in stone!” the snake also added, “You know what these are? You can tell the story? !” Sirius asked, “No no no, but I know someone who knows more about these than me, he is a Rat snake, he works at the steel forges underground, if you can bring these to him, i’m sure he can tell you what these images are trying to say. His name is Yurnani, he has a long scar going upward on his left side, you’ll know him when you see him” the eastern snake explained, “Oh! Thank you so much!” Sirius said, then she suddenly had a plan, out of no where to get herself into the steel forges. She grabbed an empty leather bag, and put the tablet in, and sneakily slithered off and got into the line to deliver different minerals and ores into the forges, and she waited for a long while. Finally it was her turn to get into the forges, “Halt, what do you carry?” the guard at the entrance asked, “Uhm, I found some iron ore” Sirius said, holding her breath, hoping he would forget to check her bag, “Okay, you can go” the guard told her, and gave her a nudge to the forges, so she went down the long tunnel, but surprisingly it was getting hotter, and soon she found herself in a large cavern with large, towering forges, giving off steam and large amounts of heat from melting iron and minerals. She looked carefully for Yurnani, she looked at every rat snake’s left side, “What are you doing?” one snake asked, “Oh sorry.. I was looking for a snake named Yurnani, he is a rat snake like you.” the snake perked up and said, “Oh, he is two forges away from my left” and pointed over to a snake that looked just like- The one who talked about valor to her! “Oh thanks!” she said and then dashed off to Yurnani, “Yurnani! Yurnani!” she called, “Hey, how do you know my name? – Do I know you?” Yurnani asked, “No, but I met a garter snake who told me about you, he said you could decode this tablet!” Sirius said imaptiently, “Slow down! So let me see this tablet! !” Yurnani said, this time sounding more impatient, “What if a guard sees us?” she whispered before he could get his tail around her bag. Yurnani stopped, looked around once- Twice- Three times, and whispered, “Tonight, meet me here at the forges, then we will talk” she nodded her head and went off. But as she went to hide the bag with the tablet in her nest in the sleeping dens, she stopped in her tracks and heard a loud voice, it sounded like Chief Boakinx, so she snuck closer to his den and listened carefully, “No luck? NO LUCK!? I said I wanted tablets found immediatley!” Chief Boakinx shouted, “B- but Cheif, what if we’re not lookin’ in the right places, yeah?” a nervous snake muttered, “I really don’t care, scour this land, leave no rock unturned! We have one but we have many more tablets to find.. These ancient tablets could be the start of something big!” the Cheif roared. Sirius gasped, and rushed off to hide the tablet, she did not know what they wanted the tablets for, but if they wanted them so badly that they enslave another clan, she obviously had to hide these carved stones, because they had some big secret. To be contiued in Chapter 3: The Lizard and the stone. Finally it was her turn to get into the forges, “Halt, what do you carry?” the guard at the entrance asked, “Uhm, I found some iron ore” Sirius said, holding her breath, hoping he would forget to check her bag, “Okay, you can go” the guard told her, and gave her a nudge to the forges, so she went down the long tunnel, but surprisingly it was getting hotter, and soon she found herself in a large cavern with large, towering forges, giving off steam and large amounts of heat from melting iron and minerals. She looked carefully for Yurnani, she looked at every rat snake’s left side, “What are you doing?” one snake asked, “Oh sorry.. I was looking for a snake named Yurnani, he is a rat snake like you.” the snake perked up and said, “Oh, he is two forges away from my left” and pointed over to a snake that looked just like- The one who talked about valor to her! “Oh thanks!” she said and then dashed off to Yurnani, “Yurnani! Yurnani!” she called, “Hey, how do you know my name? – Do I know you?” Yurnani asked, “No, but I met a garter snake who told me about you, he said you could decode this tablet!” Sirius said imaptiently, “Slow down! So let me see this tablet! !” Yurnani said, this time sounding more impatient, “What if a guard sees us?” she whispered before he could get his tail around her bag. Finally it was her turn to get into the forges. “Halt! What do you carry?” the guard at the entrance asked. “Uhm, I found some iron ore” Sirius said, holding her breath, hoping he would forget to check her bag. “Okay, you can go” the guard told her, and gave her a nudge to the forges. She went down the long tunnel. Surprisingly it was getting hotter, and soon she found herself in a large cavern with large, towering forges, giving off steam and large amounts of heat from melting iron and minerals. She looked carefully for Yurnani. She looked at every rat snake’s left side. “What are you doing?” one snake asked. the snake perked up and said, “Oh, he is two forges away from my left” and pointed over to a snake that looked just like- The one who talked about valor to her! “Oh thanks!” she said, and then dashed off to Yurnani. “Yurnani! Yurnani!” she called. “Hey, how do you know my name? – Do I know you?” Yurnani asked. “No, but I met a garter snake who told me about you, he said you could decode this tablet!” Sirius said impatiently. “Slow down! So let me see this tablet! !” Yurnani said, this time sounding more impatient. “What if a guard sees us?” she whispered before he could get his tail around her bag. This is just a suggestion, you don’t have to do it if you don’t want to.